Ethereum Classic (ETC) was forked out of Ethereum in 2016. The two coins share a common token name called Ether backed by blockchain technology and both the coins share a common platform to transfer values between themselves. Ethereum Classic (ETC) is an open source distributed computing platform which facilitates smart contracts and a decentralized Turing-complete virtual machine- Ethereum Virtual Machine (EVM). There is a transaction pricing mechanism called Gas, and its motive is to prevent spamming in the blockchain network of Ethereum Classic (ETC). Ethereum Classic (ETC) has a good return on investment (ROI) of 828.54 %, and it is ranked 17th in the crypto market as per its market size. The total coins in circulation stand at 109,582,040 ETC. The current market cap on 9th March at 03:24 UTC is 777,894,762 USD. The value of each ETC coin in terms of USD and BTC stand at 7.10 and 0.00134959 BTC respectively. The 24 h volume stands at 794,664,305 USD at the same UTC. 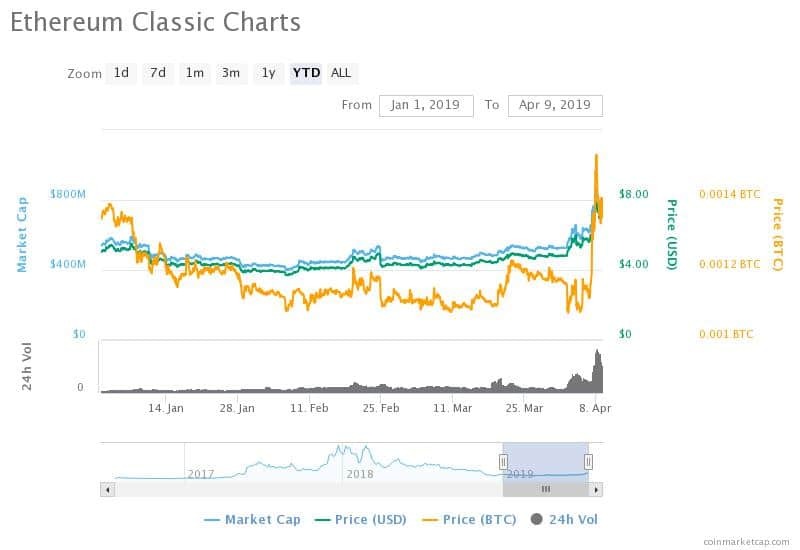 The value of Ethereum Classic (ETC) has been stable from the starting of the year barring the last week. The last week was ominous for the whole crypto market. It grew more than 50 % in the previous week. Comparing the current price with that of the price and value of the past month, one can see the difference. The market cap on 9th March was 472,343,113 USD, and the value of each coin in terms of USD and BTC were 4.34 USD and 0.00109919 BTC respectively. The current market cap, as well as the value in USD, has inflated by almost 64 % in the 30 days’ duration. The coin has reached its highest point in this week, and the lowest point was in the first week of February when it reached around 3.6 USD. As per our past predictions, the coin performed really well. The next resistance should be around 8 USD to 8.2 USD. The next couple of weeks should see the value of each coin around this mark, but the situation is surely going to improve once the resistance gets over. The target of 10 USD is surely achievable in this quarter. The resistance will be around 9.5 USD again. The short term holders can leverage their position now as they have already gotten more than 50 % profit over their money. But, the real bull is ahead. It is also not a very bad time to make a buy position. It will surely give results as per the wish of investors.